Zafrani Meetha Paratha is a sweet flatbread flavoured with saffron and kneaded completely with milk. The sugar is added directly to the dough before cooking. When it was time to cook something for Z, I knew I will pick something with Zafrani as flatbread are paired with this spice. In today’s flatbread, the dough is completely kneaded with milk and saffron soaked in milk with powdered sugar. It is then cooked in ghee. There is nothing wrong in saying this can be served as a dessert as it sure tastes like one when you roll in covered with melted ghee and garnished with chopped nuts. We are in the last alphabet of the series and though I have been writing the posts on the same day, I had cooked for the week during the weekend ahead and writing on the same day. It sure has fun doing this. So we have Zafrani Meetha Paratha in the AtoZ Flatbread and More, where I am doing AtoZ Indian Flatbread. 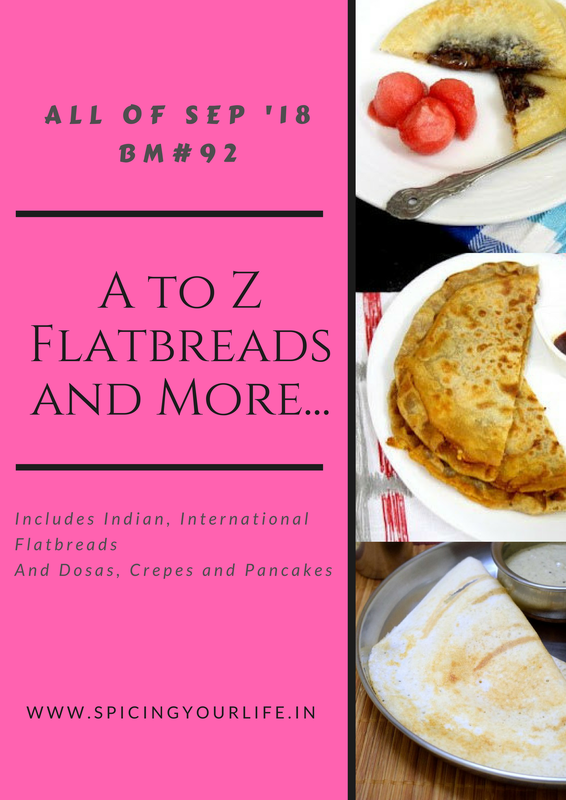 If you want to know what I did for Z in the AtoZ Dosa Varieties, hop over! Take flour in a bowl and add salt, powdered sugar, soaked saffron, along with milk and make a soft dough, rest it for 20 mins. Dust well with flour and roll out. Apply ghee and flour, make pleat similar to how we make laccha paratha or parotta. Cook on hot tawa with ghee on both the sides. This tastes very good when you drizzle some melted ghee and nuts over and roll over. That’s gorgeous Valli and a nice to finish the marathon on a sweet note….lovely pick for Z!! Same pinch Valli. I made it in a similar way except the rolling was different and we loved the saffron infused parathas. What a way to finish the series, Valli. Hats off to you ! Wow… this paratha looks so tasty and perfect for those who love sweet paratha like me. Perfect Paratha to finish the series with . Such a beautiful and royal paratha . This paratha is such a rich one with saffron and milk , a lighter version , more doable than what I made , though we loved those too ! Zafran is such a fantastic rescue while doing AtoZ ! That is a perfect dish to finish the BM. With saffron and sugar in the dough this must taste amazing. I love the idea of making it into rolls with nuts and ghee. This month was just amazing Valli. Zafarani seems to be ruling the day. Lovely sweet parathas Srivalli and to end the Mega BM on a sweet note. However, I think you may want to change the handful saffron to a few strand or pinch. I can imagine seeing this sweet paratha with aloo dahi sabji…yummy. Zafrani ruled the day. The paratha so inviting and you are right they can be called as a dessert. Yum. Such a nice way to end the marathon srivalli.So amy Zafrani recipes and if I hadnt found Zucchini I too would have made this one only! The zafrani paratha is a great recipe to end the series. Ending it a royal style! Love this meetha paratha and with the flavor of saffron, this must have been just amazing.